Hello and welcome to a great new link up happening in the cyber world of education! You are going to want to get yourself a snack and cuddle up with your laptop as you check out all these great posts with amazing teaching tips from some of the best bloggers around! My “bright idea” today has to do with keeping the great work you do with students fresh in their minds and easily available to you and to students. 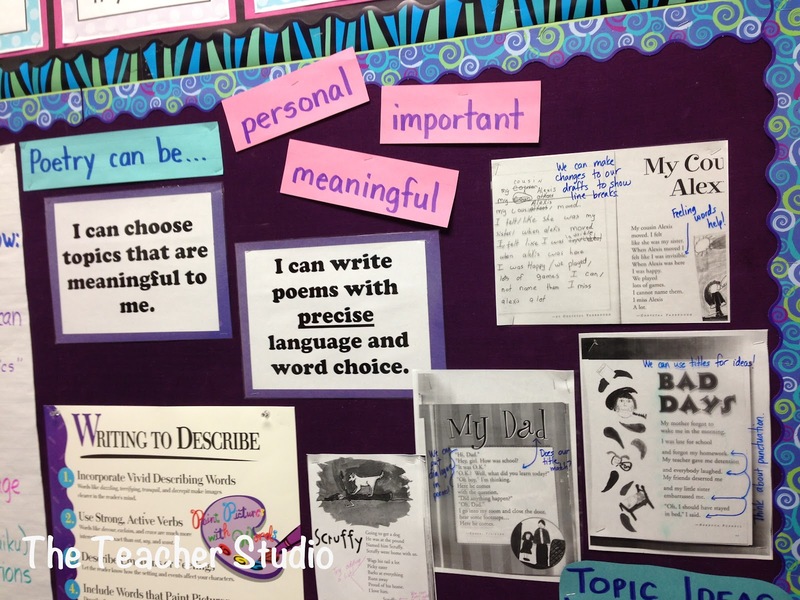 We are all familiar with anchor charts and how meaningful they can be for students as they refer to them to support their learning. How can we take them one step further? Here is part of my ever-evolving poetry board. Each day, we added on to it as we learned new features about poetry. I should have gotten in closer…but each of these poems is “marked” with the key point(s) we discussed. It’s like a visual tracing of our discussion! These are “kid poems” we used as mentor texts. As we talked about them, I used photocopies of the poems to record our thinking. Once we were finished, I hung them up on the bulletin board for students to refer to. We noticed things about repeated lines, about how the poets used line breaks and spacing, about powerful titles, and so on–and each lesson was documented and displayed. 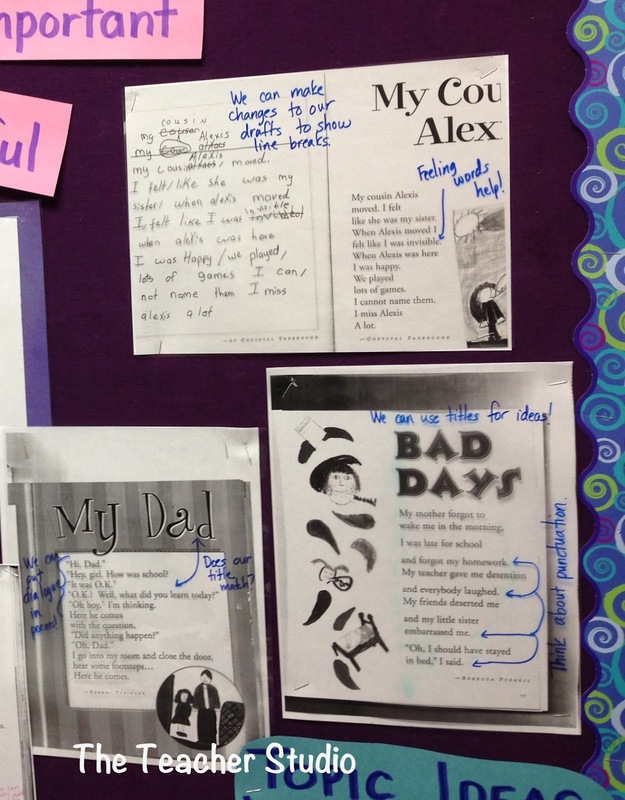 When we worked on writing our own poems, students actually sat by this board for inspiration! We studied this poem and worked as a class to “mark it up”…but once the activity was finished, I left it displayed so that we could return to it and remind ourselves of what we talked about. 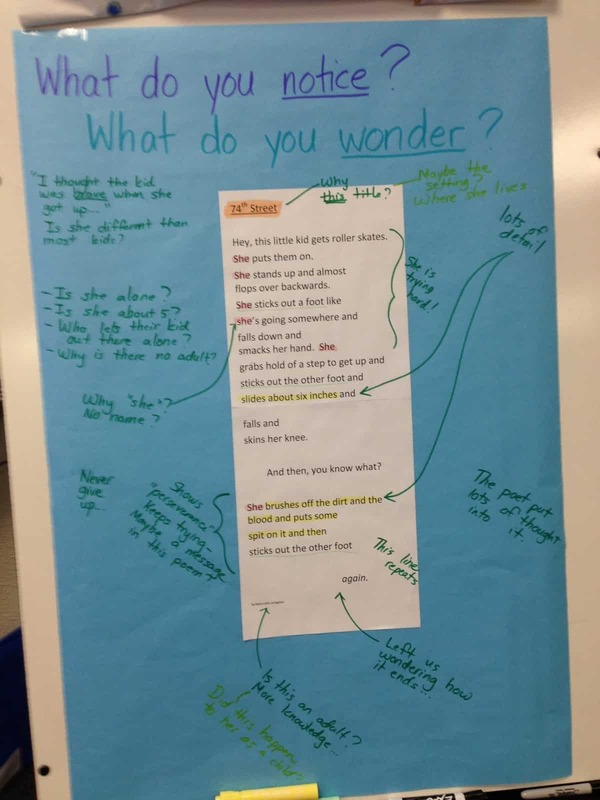 Students made connections for DAYS after we read this poem–and I’m quite sure they would NOT have had I kept it hanging by our anchor charts and other information. Find a powerful page in a read aloud? Copy it, mark it up, and hang it in clear sight! If a student finds a great example of a simile or descriptive language or evidence of character traits–or ANYTHING you are studying…make a photocopy, note why it was chosen, and hang it up! It engages students and helps YOU keep your teaching points clear! Want some more bright ideas? Click HERE to go to the next link in our hop! I’m sure you will love this post from Mrs. Jones’s Kindergarten about developing reading stamina in kindergarten! Looking to snoop around at all grades? Check out this link!